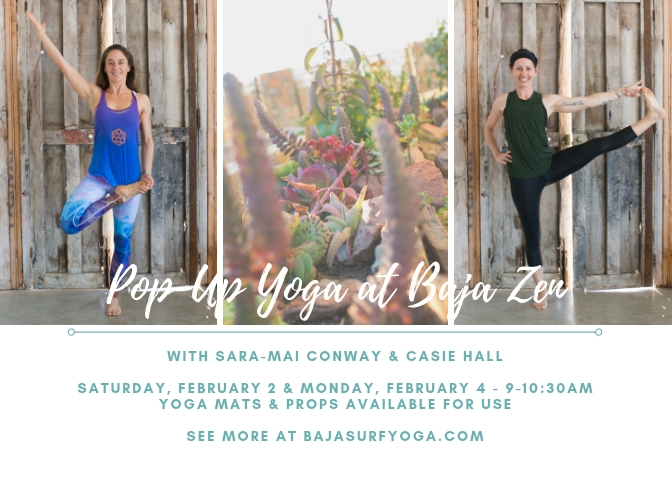 Join Casie & Sara-Mai for TWO public classes at Baja Zen in Cerritos, just a 20 minute drive south of Todos Santos, Baja Sur. Classes are 90 minutes of a vinyasa flow. Suitable for all levels. Yoga mats and props are available. SUNDAY, February 2 : 9-10:30am << NEW DAY! No need to register, just show up! *Please note studio access is via dirt road. Your Google maps may or may not work. Once you turn off Highway 19 onto the main road to Playa Cerritos, follow the small wooden signs towards Baja Zen! Pop Up Yoga in San Juanico, BCS! "This is a retreat for people who love active vacations! Fantastic mix of stimulating activities, exciting new experiences, and daily focus on getting in tune with the body while calming the mind. It was an experience I won't soon forget! Thank you." "Thank you for planning such a wonderful retreat and sharing in one of the most memorable and life changing vacations. A sincere 'Thank You' for such an awesome experience." "All my expectations were exceeded! It's a very active vacation, in a relaxing environment, with just the right amount of downtime for recharging. Everyone was and is very friendly and the instructors are extremely knowledgeable. We had some very unique experiences, ate delicious food, and saw amazing sights. I couldn't recommend it more." "The surf and yoga retreat was a perfect balance of yoga, surf, relaxation, and time spent with the group. The activities were well-planned and organized. The accommodations were perfect. The staff were amazing and made sure that you had everything you needed to be comfortable and have a great time. I can't wait to go back next year!" "Along with most of our group, I'm already planning on how to return to Todos Santos. I loved how beautiful it was, with great food and plenty of activities, yet still felt far off the beaten path. After 5 days, I felt rejuvenated and so grateful to have had the experience of uninterrupted days of meditation, yoga, outdoor adventures, and amazing food. " Baja California Sur, San Jose del Cabo, Cerritos Surf Beach, Todos Santos, Pescadero, San Juanico, La Paz, Loreto, the Pacific Ocean, the Sea of Cortez - and every Southern Baja surf point in between. We plan surf and yoga retreats in Baja Sur, Mexico. Join one of ours, or plan a custom surf and yoga adventure for your group. Perfect for weddings, anniversaries and group service trips. Yoga retreats, meditation retreats, surf camps and surf retreats, stand up paddle adventures and more in Southern Baja, Mexico. We adventure out there, but the journey is within. Stay informed on group trips, surf and yoga retreat dates, pop-up events and more.